City focused full fibre ISP Hyperoptic has today completed a major debt raise of £250 million via eight international banks, which finally gives them enough investment to fund their proposed roll-out to cover 2 million UK premises with their 1Gbps capable FTTP / FTTB broadband network by the end of 2022. Today’s news is on top of the £100m in private investment that they successfully raised last year from a consortium of four major European banks (BNP Paribas, ING, RBS and Dutch investment bank NIBC), which was itself also an addition to around £75m that had been raised in previous years. The provider, which has already built a network that they say covers 500,000 premises (mostly homes) in multiple UK cities (expected to reach over 50 cities and towns by Q1 2019), last year set a new target of 2 million premises by 2022 and a future aspiration to reach 5 million by 2025 (here). 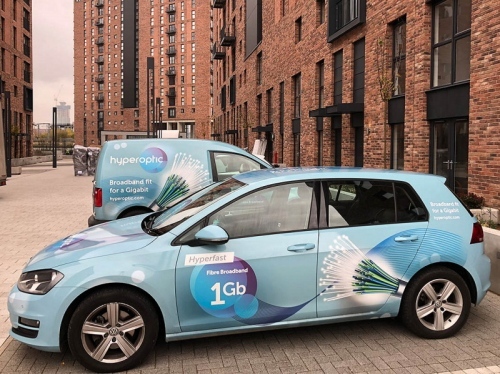 Hyperoptic is an urban focused provider and thus their normal approach involves connecting their Fibre-to-the-Premises / Building (FTTP/B) based network to large residential or office buildings in dense urban areas (e.g. Multi-Dwelling Units with at least 50 units), although they have recently expanded to do a few new build housing estates and lots of council (social) homes. Crucially connecting up MDUs in the way that Hyperoptic does is significantly cheaper and quicker (per premises passed) than a traditional FTTP roll-out, which might require a lot more street works. As such a smaller investment, when used wisely, can go a long way. Suffice to say that as one of the longest running FTTP/B ISPs in the UK, Hyperoptic is now a serious rival to the major players in optical fibre (Openreach, Cityfibre etc.). Today’s news also means that their future network expansion will create another 1,500 jobs (doubling its current 600 staff across five offices) and 400 of those could be added by the end of this year, followed by 1,000 during 2019. Not that any of this will come as a huge surprise to anybody who has been following the core management team since their early days at BE Broadband (BE Unlimited), which was an excellent ISP until O2 gobbled it up (this was around when Dana and Boris moved to setup Hyperoptic in 2011). After that BE was sold on by a struggling Telefonica UK (O2) to effectively become Sky Broadband. The fact that their residential broadband packages are not merely incredibly fast, but also incredibly cheap, is another one of their key selling points. Prices tend to start at around £17 per month (special offer) for their 30Mbps service and rise to £45 (£60 after a discount) for 900Mbps with free installation, which is tough to beat. Excellent news and well done them. As long as wayleave doesn’t get in the way too much they can have most MDUs covered and be able to hoover up townhouses in the developments too. Access to gigabit connectivity whomever supplies it is great. Forces the competition to do better as well as delivering the service to those who want it. That it’s symmetrical is a bonus, too. Openreach FTTP rolls in at 220Mb up and well over £100 a month, VM’s gigabit service will likely have only 50Mb upload for the foreseeable. It would be even greater if they started to just do cities too – they would wipe the floor with BT if they wanted to? VM are going to have 1GB? Yes. Didn’t realise this was news? Well done to them they are now on track to become one of the biggest FTTP suppliers in the UK. That is 2 million less homes to connect to FTTP by others. And this is now a fully funded 2 million so not a fantasy number. As @CarlT points out this is providing good downwards pressure on price and also pressure on OR to switch to symmetric. Although most of the other Alt Nets are cheaper than OR and are pretty much symmetric. So OR is looking well behind the direction of travel on this. OR really need to switch to symmetric. it’s painful at how long it takes to upload large files to the cloud and to clients. I doubt it, OR will eventually build over the top of Hyperoptic and this will happen everywhere. There is no real plan for fibre optic, companies should be building together to create one network, not several that use different technologies etc. Should really look at Australia’s NBN which was a complete plan of what can be successfully be delivered and where using the different options. I really don’t think anyone should be looking at the NBN as an example of how to do it. It’s great to see Hyperoptic doing so well. Long may it continue. I only wish they (or anyone!) would consider FTTP in the south Wales valleys. I fear we’ll be the last clinging on to the old aluminium/copper lines. I wonder if the push for ‘true fibre’ will mean Hyperoptic eventually change their usual FTTB approach to FTTP direct to people’s homes? Valleys aren’t likely to have many of the type of property that hyperoptic are concentrating on, that is more like the sort of environment gigaclear are working in. download and upload for 200 properties using welsh gov grants using volunteers to save costs We are the fastest village in Wales, I have seen 500 Mbs on my mobile phone. I am in Newport – still waiting to get past VM’s offering – I would move to your area for the internet if I could! Be a lot cheaper than Brighton or Bournemouth. I live around 1700 m from a fibre cabinet, and in evenings broadband speed falls below 0.5. All this talk about super fast broad is great if u live in an area where companies make money, otherwise 4 get it. I would be happy if I could consistently get a speed of 2!! Sounds like you are on ADSL still and your cabinet is not Fibre (FTTC). Hope you are not paying for a higher product. We had a nationalised communications company but Margaret Thatcher’s government decided otherwise. BT has made some pretty poor decisions over the years but Ofcom’s approach and overhyping of FTTC hasn’t helped. OR is now detached from BT (almost) and heavily regulated. Going forward OR will only have a percentage of the FTTP market. Hopefully the imminent Ofcom announcement on the USO will include FTTP as a criteria allowing you to move to a practical broadband speed and faster options for the future. How rude of companies not to spend their money in places where they can’t make it back. My taxes have better things to do than compensate BT shareholders billions and plug a huge pension gap because a very small proportion of the country feel entitled to the same services as areas with many times the population density and a fraction the cost per premises passed. Openreach & Virgin Media should take lesson from Hyperoptic 1Gbps FTTP for 2 Million UK Premises. Given VM are spending £3,000 million digging their way to 4 million properties I am not sure they have too much to learn from an MDU-only FTTB builder spending a quarter what they are per premises. Completely different business models and circumstances. I sincerely hope Hyperoptic and the other Altnet providers expand and become a more dominant force! This should give BT Openreach a good slap for not doing their jobs properly in laying enough Fibre in a timely manner. BT Openreach have for too long tried to be stingy with their Copper FTTC/G.Fast roll-out. And even then for too many years people such as myself with EO Lines have yet to be upgraded with FTTC even when located in important urban areas and locations. And then again OR betray one time saying on a plan for FTTP and then the next time it’s downgraded back to Superfast plan. BT Openreach are pathetic & incompetent. I think it’s only a matter of time when BT Openreach will Rest In Peace. Whether it splits up completely or not. Openreach and BT will become a very small company in future. It shouldn’t be about punishing BT Openreach. What we need is sufficient overall investment in the UK for FTTP progress to eventually to cover 29m premises. There are a lot of factors that will determine what eventual market share OR will have of the FTTP market. It will not be anywhere near 100% but it will remain significant. @TheFacts: Because it is at the heart of the City of London where there are too many commercial and international banking activities. Even many office working people living in these block of flats require faster speeds as this will help them complete project assignments that will benefit offices and businesses along with the high rental and property prices. @Rahul. Hyperoptic appear to have an effective solution to city high rise but are being supported by the landlords including local authorities. With such high rents perhaps the landlords of these blocks could do more in making them data ready instead of just the old phone line. OR are now appear to be working on the EO community in places like London and hopefully this will form part of their FTTP plans. However retrospectively cabling tower blocks has significant challenges particularly if the landlord or association are not on board. My personal view is FTTdp still has its place on some of the older buildings due to the accessibility and cost. What is more frustrating is there are brand new and renovations/conversions in London without any design consideration for data. @Meadmodj: The problem that may slow Hyperoptics ambition is the wayleave problem. Because as I have mentioned in the past I am a Hyperoptic Champion of my building and I have struggled to convince my building authority to sign a wayleave agreement for over 3 years now despite all the residents in the building demanding it and registering their interest. If this continues in blocks like my own then it may mean that BT OR will also struggle to sign wayleave for the properties belonging to EO Lines that they wish to upgrade to FTTP. The problem however is that people like me have been waiting for years just to get FTTC and we haven’t been upgraded to FTTC yet never-mind FTTP seeing how BT’s checker has now downgraded their FTTP plan back to Superfast. Leaseholders of these central urban blocks also don’t permanently live there as they use these flats just to rent out for business. So there is a disconnect in organisation and unity to team up and meet with the authority to convince them to make a wayleave agreement. Since most of the leaseholders themselves don’t even care as they only use the property for rental business rather than their own living. This leaves me alone to fight the case myself individually and this is where things get tough as I alone try to convince the authority they don’t feel under-pressure thus they ignore the Fibre wayleave matter and the years fly by with no progress. The sad part is that my friend who has bought a house in Beckton area has both Virgin Media and BT OR supported. And his house costs a fraction compared to mine near the City. This is where my biggest complaint is when you consider property prices are so high in Central London and you don’t even get FTTC, I consider that as somewhat injustice. @Rahul. Despite the vitriolic views towards OR on this site they may be the best bet in these situations. Openreach will become more flexible and start to consider wider FTTdp solutions for such situations. It means tapping into the local distribution cable and creating a mini cabinet (SCP prior to 70s) but suitably equipped with the latest Gfast 212MHz could provide giga speeds on the “spares” or move the customers to VoIP. It does mean more street furniture and power but there is nothing wrong with G.fast if used appropriately whilst the wider strategy remains FTTP. @Rahul – if your area is so ‘important’ I don’t understand why any other of the over 100 companies with Code Powers who have had over 30 years to provide you with a service have not. Would you like a list so you can complain about them all? @TheFacts: The fact that you quote ‘important’ in inverted commas means you feel offended. I didn’t mean to try and be arrogant by the area I live in. You’re misinterpreting me and taking it a little bit too personally. My whole point by ‘important’ was that based on property prices it is basically unacceptable for a property market value that costs between £750,000-£1000,000 to not have any Fibre broadband facility. Meanwhile the example I gave of a friend who bought his house in Beckton and I forgot to mention that they bought it for £190,000 but has both FTTC from BT OR and 350Mbps Fibre from Virgin Media. The price of the property is determined by area of importance but not necessarily on quality or size of the flat/house. You can have a very big house in Beckton for a very cheap price that is of better quality than most properties near the City of London or properties near the River Thames. But the fact remains is that in central urban areas properties will always cost more than in other parts of London like Dagenham, Redbridge, Ilford, Beckton, etc & there is nothing for you to feel offended by this, that’s the reality. It is irrelevant to mention 30 years because Fibre broadband is a relatively recent development and its availability in the UK only began around 2011. @Rahul – I am not offended! Plans recently announced mean you will get FTTP eventually, the reason you have not got it now is suppliers have not seen a case for it. Have you contacted Hyperoptic and sorted out access in your building? They have a lot of coverage in London. Reasonably sure no-one is required to live in zone 1 and no job requires living in zone 1 or even zone 2. You pays a ridiculous amount of money, you makes your choice. For the ridiculous price of those apartments you could get a pleasant house in Richmond upon Thames. I do assume here that you either own the property or pay the rent yourself, and are not a social tenant. If living with parents or holding some other kind of grace or favour the maths changes, but I can’t say I understand spending years complaining about broadband in part on the grounds that the property is incredibly expensive. Maybe it’s just me, though I lived in London for a decade, albeit no closer to the centre than zone 4. I have tried contacting Hyperoptic. I’ve given them the details of my Housing Estate Manager and Technical Services Manager 3 years ago. They have been in contact with them but the building authority said that at the moment they are busy with other priorities. They are going to replace cladding of the building with safer cladding so it’s not fire flammable following Grenfell Fire incident. Once this issue is solved then they will probably focus more on the Fibre agreement. But I am still waiting for them to sort out Fire Safety matters. @CarlT: We don’t pay a ridiculous amount of money anymore. : ) As the property was bought over a decade ago it was only £96,000 at that time we are now only paying another 20K for external/internal building decoration such as cladding balconies and windows. Thus I don’t pay rent so life is easier living centrally plus I’ve lived here all my life since childhood. I am adapted to the City, riverside, etc. But of-course if we didn’t own the flat and had to pay rent then it would’ve been a different matter. If Fibre gets agreed, I won’t have any other major complaints. Great to see, another FTTP roll out with no whining about costs, no asking for other providers help, or expecting help from governments, local authorities etc. Just a go out and get it done attitude. I wish that would rub off onto BT! Looks like a classic bubble to me. This company has no assets apart from a load of copper wire in flats and they are burning money fast. The owners will bail soon with a lear jet full of cash. Must be a long bubble considering the company has been around since about 2010 or fast approaching a decade. Hyperoptic ‘copper’ is Cat5e or better. So you can get a couple of G down it at least. We have loads of long cat5e runs in our offices which have been fine pushing several G down them we were all about to recable them, when we went to 10G on the core switches, and then found that with modern routers it wasn’t a problem at all . This is totally different to OR copper which is standard phone line. So I don’t really see the Ethernet copper being limiting for a long time. Using Ethernet is/was a sensible cost optimization when skillls to put in fibre were limited and people readily available to terminate data cable. The commercial rates for terminating data are also historically very competitive. So, and I don’t know if they do this, you could use pretty unskilled guys to drill the walls and put the cable and trunking in and then get a contractor to come to site and terminate the lot, test it, all at a very tight fixed cost. It is not as silly a strategy as it sounds. Now with connectorized blocks era I’m not convinced it makes the sense it once did. But as with most SME’s, once you have figured out how to do something and make money out of it then you probably don’t fiddle too much with the model. Anyway good luck to them, I know people who use it and they generally say reasonable things. Granted they are not doing massively heavy IT over it but the feedback is that it does what it says on the tin. Extremely unlikely which is a good thing. A strong Openreach benefits nearly everyone. Personally I would prefer OR to wake up a bit more. Their deployment costs still look high to me. The problem is the ‘every home connected’ mentality. Agreed it is the only way to switch off copper but the long costs fail drives up costs and slows roll. Commercially I find it very odd that they don’t work on the low hanging fruit just to get deployed numbers up. And then have a slower backfill rate on the long tail focussed on the exchanges where switch off is realistic. In some cases the long tail will be first where there is High % of GFast and FFTP is easy to deploy and there is no Alt Net competition.